Today, in honour of National Young Readers Day, innovative mattress start-up Casper are encouraging everyone to share their favourite bedtime stories… and you know me, I didn’t need much encouraging! So, what was my favourite bedtime story when I was a Young Reader myself? 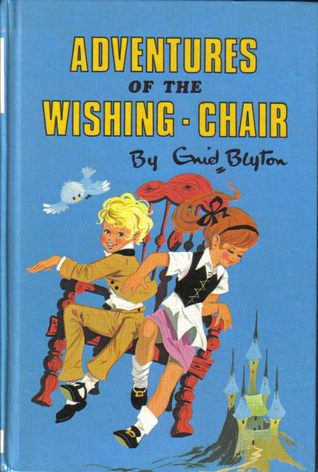 Once Mollie and Peter have discovered the Wishing-Chair, their lives are full of adventure. It takes them to all sorts of magical places, from the giant’s castle where they rescue Chinky the Pixie, to the amazing party at Magician Greatheart’s castle. All these years later it seems like a unpopular opinion, but I actually remember loving these books more than Blyton’s Faraway Tree series; I certainly remember reading this one with my parents more as well. I was totally gripped by Molly and Peter’s adventures, and rather than each book having a different adventure, in this book almost each chapter did. As much as I enjoyed The Enchanted Wood in the Faraway Tree books, Fairyland was just as magical to me, if not more. Just seeing the cover brings back great memories. I must pick up a copy again soon, and I think you should too! Casper recently launched an innovative new mattress, because not only is bedtime the best time, but everyone deserves a great night’s sleep! They are celebrating Young Readers Day by sharing everyone’s favourite bedtime stories. The Casper Team have already shared their own on their blog, here. For more information, check out their website, and follow on Twitter and Facebook to see what bedtime stories have been shared so far! Or why not share your own? Author lipsyyPosted on November 11, 2014 November 12, 2014 Categories Book Geeking, PromotionsTags Adventures of the Wishing-Chair, Bedtime Reading, Bedtime Stories, Casper, Children's Books, Children's Classics, Enid Blyton, Young Reader's Day2 Comments on My Favourite Bedtime Story!